Truly delicious and you don’t need a recipe. 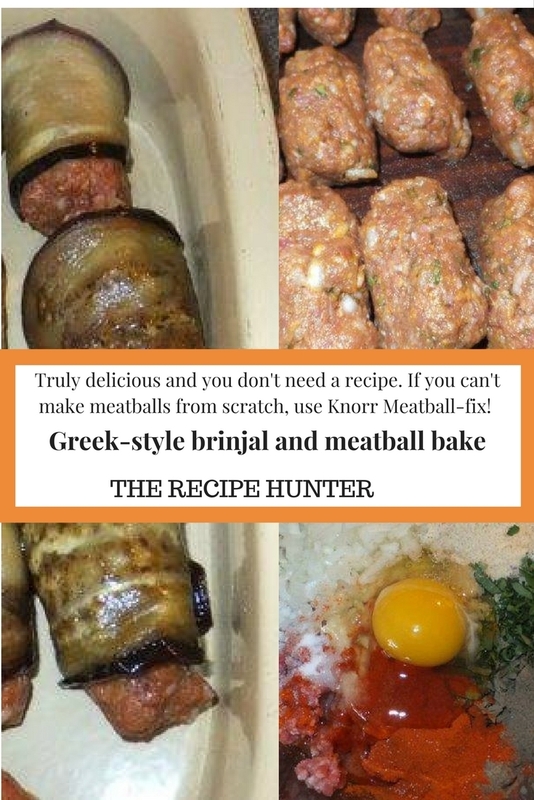 If you can’t make meatballs from scratch, use Knorr Meatball-fix! Cut brinjals lengthwise into slices about 5mm thick. Chop up the odd bits to go into your sauce later. Place in a colander and sprinkle with salt, let it sit for about 30 min. Lay in a roasting tray and brush with olive oil. Mix your mince for your meatballs – I added finely chopped onion, chopped fresh oregano, salt, paprika, black pepper, dried bread crumbs and an egg. As an afterthought, I decided to add a bit of tomato ketchup and Worcestershire sauce. In the meantime, form oblong meatballs. Wrap the meatballs in your baked brinjal slices. Fry your cubed brinjal and a chopped red pepper until soft. Pour the sauce over your brijal rolls and top with grated cheddar cheese mixed with dried bread crumbs. Bake in a 180°C oven for about 40 minutes and serve with garlic bread and a nice salad.